Edward Raymond Payne, the renowned stained glass artist, spent most of his working life in Box living in the house known as the ‘Triangle’. He was born in 1906 in Birmingham. His father Henry, a teacher at the Municipal School of Art in Birmingham, married Edith Gere in 1901. They were both members of the Birmingham Group of artists and had close links with the Arts & Crafts Movement. In 1909 they moved to Amberley in Gloucestershire. They settled in the old schoolhouse (‘St. Loe’s’ now renamed ‘Seynckley House’) which his friend, Sydney Barnsley of Sapperton, had restored. Henry followed a successful career as a stained glass artist and mural painter (for example at Madresfield Court near Malvern and the Palace of Westminster). The whole family was involved in the running of the studio and it provided a happy and fulfilling childhood environment. Edward’s mother, Edith, was also a gifted botanical artist and a major exhibition of her work was held at the Birmingham Museum and Art Gallery in 1979. In 1913 Edward went to Junior House, Cheltenham College and subsequently to St George’s School, Harpenden. He was sent in 1923 to The Royal College of Art but after two and a half years he returned home to help in the family studio. He subsequently returned to college again for a year in the company of his brother. He was able to get a wide grounding in etching, drawing and painting which he clearly enjoyed. Immediately after college he spent six months at the William Morris factory at Merton to train as a manager but he decided that this was not where his talents lay. Woodgreen Village Hall in Hampshire was built during 1930-31. 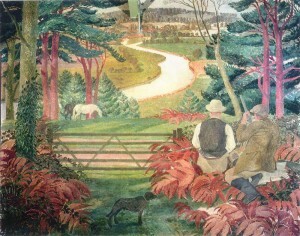 In 1932 Edward Payne and Robert Baker a fellow student from the Royal College of Art were commissioned, by the Carnegie Trust, to decorate the walls entirely with murals. They painted the village as it was then with local scenes. The BBC, in a broadcast in 1973 called it the ’Village on the Wall’. These murals are still in good order and can be visited by appointment. There followed a period which he described as his ‘formatory years’ spent in the homes of ‘well to do’ patrons doing wall paintings and decoration. These included the homes of the then Minister of Education Oliver Stanley & his wife Lady Maureen. At this time he became engaged to Molly Sailby and married her in 1937. He describes how the effects of impending marriage and perhaps a religious conviction indicated that he should abandon his wall paintings and move on as a dedicated stained glass artist. He returned again to Amberley to help his father who was ready to pass on commissions. The first of these was ‘the baptism of St John the Baptist’ for France Lynch Church. In 1938 his father became severely ill and Edward with his new wife Molly moved close to St. Loe’s. Sadly his father died in 1940 and the last thing that Edward did with his father was a tapestry design for a private house in Worcestershire. He was called up at the end of that year and served in 4th/7th Royal Dragoon Guards. 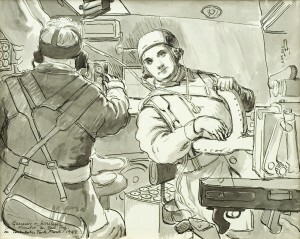 He seemed to have had a happy time and in his spare moments drew portraits of the men and scenes of Army life. He was not an official war artist but several of his paintings are in the Imperial War Museum and over 40 are in the Regimental museum of the 4th/7th Royal Dragoon Guards in York. His war experiences gave him a feeling for the ‘common man’ which was to influence his life and work thereafter. After the War he returned to set up home in the ‘Triangle’. The house was built in the late 1930s and the distinctive large windowed studio was added at the end of the war. The view from the house which overlooks the village is featured in an early watercolour. From 1952 he taught life drawing at the Stroud Art School and was later given charge of the windows in Gloucester Cathedral, where he did all the repair work from the sixties onwards. Click here for a gallery of Miscellaneous pictures. The life of Edward Payne (continued): He lived and worked in Box through most of his productive life. His work was split between repairs, the creation of new windows, teaching and his own paintings. There are about 70 of Edward’s windows recorded in locations throughout England and Wales – and also overseas. Two war memorial windows in Gloucester Cathedral are by Edward and there are many local churches which also contain his work. These include: Minchinhampton, Avening, Brimscombe, Chalford, Painswick, Randwick, Rodborough Tabernacle and St. Joseph’s RC in Nympsfield. 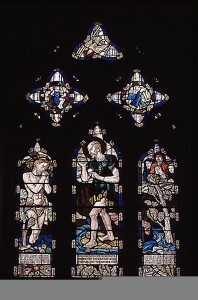 The work of which he was most fond was the Pilgrim’s window at Newnham on Severn. 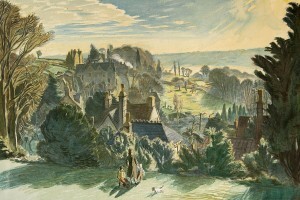 He became a member of the Cheltenham Group of Artists and regularly exhibited paintings and children’s portraits. In 1984 in recognition of his contribution to the Arts & Crafts movement and to stained glass, the Birmingham Museum and Art Gallery commissioned a tape recorded interview for their Archives. St. Barnabas, Box was the first stone church to be built after the Second World War and Edward was involved in its design. As his ‘home church’ it is fitting that it is blest with three of his windows. A window by him that also acts as a memorial to his life was installed recently by Edward’s former assistant Graham Dowding. Edward’s Christian faith and knowledge of the Bible is apparent from his work and he was very supportive of the work of the Parish of Minchinhampton with Box. 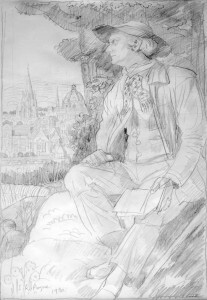 For a number of years he provided a drawing every month for the front cover of the Parish Magazine. Besides his window making and painting, Edward was closely involved in Box village life. He was a good friend and neighbour to all and would go out of his way to help those in need. Many have been in receipt of hand written notes or little cartoons. He did not use professional models but drew inspiration from his family, friends, art college students and village residents both young and old. Edward enjoyed teaching and watercolour painting. He founded the Box Art Group in 1985 which has always met in Box Village Hall. It is still going strong with currently about fifty members, including some of the original founding members. Graham Dowding worked as an assistant with Edward from the early 1980’s and assisted with the conservation of glass at Gloucester Cathedral. 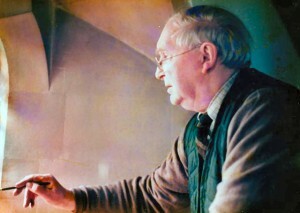 He took over this responsibility in 1983 and in 1993 he established a studio in the refurbished Ruskin Mill. The Ruskin Mill Centre for Cultural Development was inspired by the work of John Ruskin, William Morris and Rudolf Steiner and provides educational opportunities amongst the studios of dedicated craftsmen. Edward Payne’s first wife Molly died in 1974 and in 1975 he remarried. In the next fifteen years Edward remained productive, supported and encouraged by his second wife Mary. His daughter Caroline Swash is also a successful stained glass artist, writer and lecturer at St. Martin’s College of Art Design and freeman of the Worshipful Company of Glaziers and Painters in Glass. It is fitting that one of her windows can be found in Gloucester Cathedral. One of Edward’s last drawings was of ‘the Scholar Gypsy’ and his last window was for The United Reform Church in Croydon, both completed in the year before he died. The centenary of the birth of this leading stained glass artist was marked with the first major retrospective exhibition of his work, staged jointly at Ruskin Mill, Nailsworth and Box Village Hall (20/05/2006 – 04/06/2006) together with a lecture on his stained glass given by his daughter Caroline Swash. The concept of these exhibitions came out of the community in Box. Seed funding was obtained from local bodies, individuals and charities enabling successful application for a significant Heritage Lottery Fund grant. There was a gratifying response to requests for material for the exhibitions with over 300 items offered. Many pictures were made available by a number of private collectors and local residents. Over 40 war drawings were loaned by the Regimental museum of the 4th/7th Dragoon Guards in York. The Ruskin Mill exhibition explored his career as a maker of stained glass, and showed several of the original cartoons and studies, as well as examples of his glass and large scale reproductions of windows. 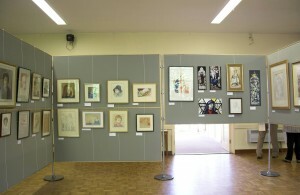 Edward Payne’s drawings and paintings were shown in Box Village Hall. This exhibition was curated by Malcolm Martin and that at Ruskin Mill jointly by Malcolm Martin and Graham Dowding. The exhibition in Box Village Hall was opened by Carolyn Elwes (President of the Gloucester Guild of Craftsmen). Over 2,500 visitors (including 125 children) attended these events.